Travelling around Cuba can sometimes be a bit of a hurdle race. Not literally of course. 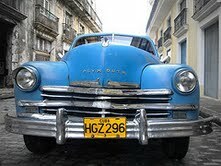 When I was visiting Cuba in the 90s, there wasn't much of a public transport system to speak of. In fact, there was only one train a day between Santiago and Havana and some unreliable bus routes here and there, but that was it. On the other hand, it was really easy to hitch a ride in one of the vintage cars that you still see everywhere in the streets of Cuba. The owners would just drive by and offer to take us anywhere we wanted to go, hoping to make a quick buck. The fact that there are still so many old timers around is really the result of the continuing embargo with the outside world. 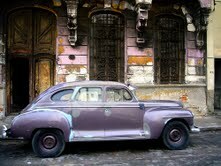 Cubans are only allowed to buy and sell cars that were built before the revolution. Not so great when your car breaks down and you need to find replacements parts, but the up side is that they give the streets of Cuba that quintessentially classic look. I have to admit that I got very excited the first time my travel buddy and I hitched a ride in one. It made me secretly feel rather Grace Kelly-esque and my travel buddy shyly admitted that he fantasised about being part of the mafia doing all kinds of illegal things. Those fantasies were quickly shattered one night when our car broke down in the middle of the night, somewhere in the middle of nowhere. After having fiddled around under the hood, the driver urged us to get out, get behind the car and get pushing.After a lot of huffing and puffing and swearing and sweating, the car came back to life.I do doubt that Grace Kelly and Al Capone ever had to get sweaty to kick-start a car, but we made it to Havana in one piece. 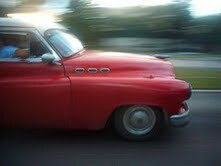 I do still believe that Cuba's old timers are a great way to get around. And the odd break down is just part of the fun. I once ALMOST went there. I got really inspired after watching the art of travel and even bought a guide book, but then a few things happened, and I've never made it to Cuba -shame! Is it save to hitch a ride like that? I was going alone, would i be able to do that safely?